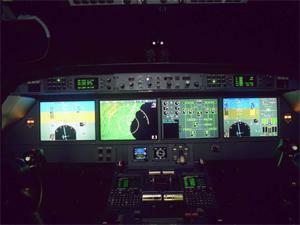 Are you a fan of Flight Simulation, are you interested in its history. Do you have any problems you just can’t find the answer too. Like to know how to install your downloaded scenery correctly, wonder why flight simulator often crashes. All the answers are available to any question you may have in this 246 page book. 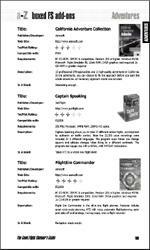 The Good Flight Simmers Guide 2002 is a book that specializes in one thing, Flight Simulators. Are you a fan of them, if the answer is Yes, then you need this book. 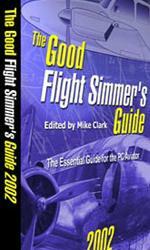 Below I will review the Good Flight Simmers Guide 2002. If you’re a good reader, then that’s good you will be able to read and enjoy this book. But if you are like me, who doesn’t do a lot of reading, especially books the size of this. Don’t worry; this book doesn’t need to be read fully. If you read it all then you’ll probably read things that you will already know. Anyway I will give you a quick run-down on what this book has to offer. 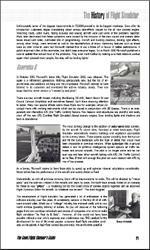 On the first 20 pages the History of Flight Sim is explained. From the earliest ever FS which was called ‘Flight Simulator!’ which was designed by a company called SubLogic, The very first company to develop Flight Simulator. You will find out how and when Microsoft first got involved all the way down to the latest on FS2002. Screenshots of every Flight Simulator are given so you are able to see how they have evolved from 1978 to 2002! Find out who Bruce Artwick is, and why he is so important to the design of Flight Sim. All very interesting to see how the game you are flying on first started and sold 21 million copies of Flight Simulator by 1998! The next section is about Hardware. 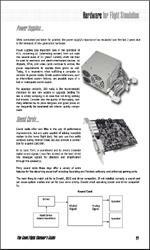 This section is extremely useful, find out why FS locks up, cable bundles slow down FS and more, every answer you need concerning Hardware can be found here. Get information on what cards to buy, which cards make FS run better, and why. Find out what all the abbreviations, such as RAM, ROM, SDRAM etc… all mean and what their purpose is, and how Flight Simulator uses them. Next I need you to answer me a question. How are you reading this? The answer SHOULD be the Internet. If you said that well done! Are you new to the internet, or just don’t know what to look for. The next section after hardware describes why the internet is such a big part when Flight Simulation is concerned. Find out how to find the pages you are looking for, find out about downloads, how to download and how to make it work on your Flight Sim. All this may be second nature to some but others haven’t got a clue. So either way the book is great for all of us. Well, have you ever wondered why sometimes when you download a file it won’t work? What do you do then; all this is explained in the book. Ever downloaded a file which contained no ReadMe, and wondered what the hell you are supposed to do, well don’t fear this book will save you! Next, you will be taken on what I call as, The Ride Of Your Life! 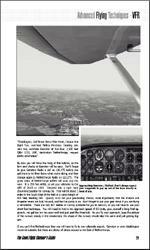 As you follow the pages you will be taken on two adventurous flights, both VFR and IFR and you will learn a lot you didn’t know from just flying in FS. In the VFR flight you will be given a full flight from Wellesbourne Mountford to Neherthorpe flying the Cessna 182S. You will be given Full instructions, weather settings and pictures to make the flight as realistic as possible. You will find out what the term FREDA means, and lots of other useful terms that come in handy when flying. You are then given a cut-out Flight Log so you can check your waypoints as you fly. Next is the IFR route, slightly harder and much more complicated. In this flight you have a total of 7 waypoints. Again it is in full detail telling you what height you are supposed to be at, speed and heading throughout the flight. Next is ‘The Flight Of Your Life’ this flight will take close to a full working day to complete successfully. But if you think after takeoff you can relax, watch the scenery etc.., the answer is an extreme No, you will be kept busy throughout the flight, flying to different waypoints, heights, speeds, headings, airports, coping with difficult and good weather. I suggest only the confident pilot, who has lots of time, should try this one. Now we have arrived at page 100, we are given 4 full pages of very hard brain teasers that even an airline pilot will have trouble working out. It has been planed that there are a total of 52 brain teasers and you need to answer 1 a week. Then for the pilot who enjoys a little fun, while cruising, we are given a Crossword and Word Search that will keep you busy. Now the next 200 pages concentrate on only 1 thing, boxed addons of any kind, including, Aircraft, Scenery, Utilities, and Adventure. 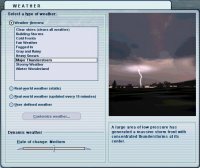 Every addon is included given a full description, the Publisher or Developer, their website, how many stars (1,2,3,4 or 5) 5 being best, compatible with the flight simulator version, full system requirements and ‘In a Word’ for example, Interesting Enough or, Boring, hard to understand sounds. So if you are looking for a specific addon this is the place to find it. After you have looked, remembered all those old addons you’ll find your self more a less at the back of the book. Now im sure you have all had those moments where you’re bored out of your brains, with nothing to do, you have been to all the local museums but want something different. Next in the book are 8 FULL pages of museums and where to find them. Sadly this is only for USA, And the UK. But if you want more to do why not look at the Aircraft Manufacture pages, everything from Britten-Normal Ltd to Rans Inc. With their website address, so if that doesn’t interest you….Well! Now probably the most used for anyone will be the Flight Simulation Websites, with 6 full pages of flight simulation websites for Books to Training. Most will be listed here. And now finally the glossary, describing each term in a few words. So if you want to find a term that all pilots use, look here. And you wouldn’t believe it but the good people have also included a Morse Code diagram!!! Now the pages with those all important answers!!! But will you dare to look! And that is the end of the review for The Good Flight Simmers Guide 2002. A magnificent book, for a small price of £14.99. If you are a Flight Simulator Enthusiast there is no way your Simming will improve without this book. A book that is a BIG YES for all Flight Simmers. It includes a total of 348 amazing screenshots, that im sure you will all be interested at looking at. TecPilot for letting me review this book!